“Dr. 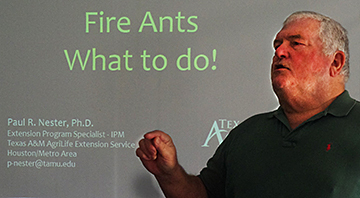 Fire Ant”, Dr. Paul Nester, Entomologist with Texas A&M’s AgriLife Extension Service, part of the Fire Ant Project Team of the Texas Imported Fire Ant Plan made his third appearance on Sat March 14, discussing management of the imported fire ant. This was one of a series of six programs to be presented this year by the FOR Environmental Committee. Dr. Nester advocates using the “two-step” approach of controlling fire ants by broadcasting a bait insecticide over your property year twice a year - after April 15 and before July, then again after Labor Day and before November. Treat individual mounds individually as needed by spreading bait around mound, not on top. The next program on boating safety is planned for May. 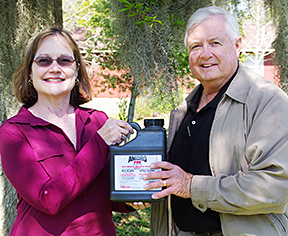 Albert Smith (who takes aerial photos of the river mouth), door prize winner at the fire ant program, receives a bottle of Amdro Pro fire ant bait from Environment Committee Chairman Barbara Fratila.